Seguramente otro día volveré para hacer más croquis de este hermoso edificio, y sobre todo de la esquina y las fachadas de ambas calles en fuga. Dibujado en Lamy EF y F con tinta resistente al agua. Luego un poco de acuarela en mi escritorio. En libreta Brugge 12x19. Entre las 2 sesiones tarde 80min aprox. Another sketch on 2 lunchbreak dedicated to the same subject. 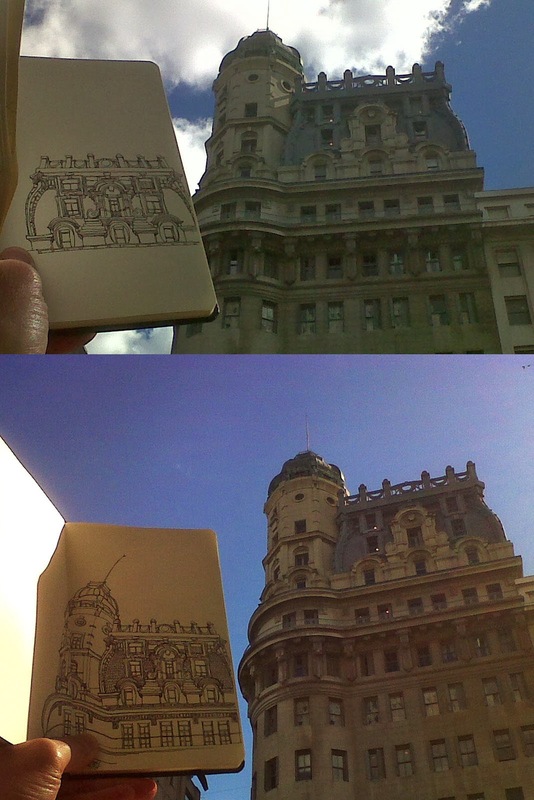 For a while I wanted to draw this building but can´t find a day day with a few spare hours to spend in this task, so on a weekday walking along Paseo Colon Av., on either side of Alsina St. to set my POV finally decided to draw Paseo Colon´s facade, lean on a grating of the gardens of the Ministry of Defence. Was cold and sunny, but the wind from the river had no mercy on me. Surely one day I will return to do more sketches of this beautiful building, and especially the corner and the facades of two streets on the vanishing point. 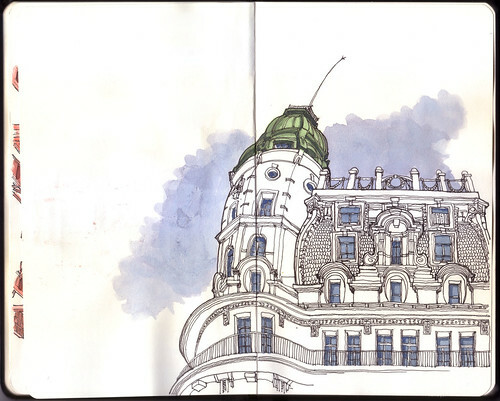 Drawn in Lamy EF and F with waterproof ink. Then bit of watercolor @ my desk. On sketchbook 12x19cm. Drawing 80min between 2 sessions.